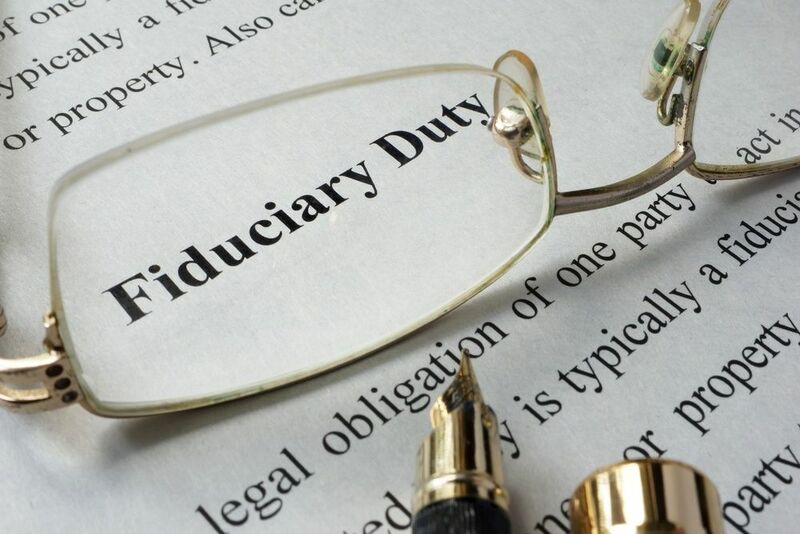 Over the past decade, several high-profile 401k fee lawsuits and DOL efforts to implement a fiduciary standard for professional investment advice have put 401k fiduciary responsibility in the national spotlight. This attention has done little to help employers understand and meet their 401k fiduciary responsibilities. Most employers are still confused and risking personal liability if 401k fiduciary responsibilities are not met. Understanding fiduciary roles and responsibilities is key to addressing the issue. To clarify their fiduciary responsibilities, I recommend employers understand the basic fiduciary hierarchy applicable to all 401k plans and the responsibilities of each role within the hierarchy. An org chart of this hierarchy can be found below. It includes both fiduciary and ministerial (non-fiduciary) roles. The blue boxes indicate roles generally filled by the employer sponsoring the plan, while the other boxes indicate roles filled by professional 401k providers. Because employers have an ongoing responsibility to monitor their 401k providers - to be sure providers are doing their job at a reasonable fee – they hold the top positions in the fiduciary hierarchy. For this reason, employers should hire providers that are easy to monitor. Providers with transparent fees and services are the easiest to monitor. ERISA section 3(16) Plan Administrator – is the person or entity "so designated" in the plan document. The employer is the default Plan Administrator if none is designated. The Plan Administrator is basically responsible for any fiduciary responsibility not assumed by the ERISA section 403(a) Trustee. 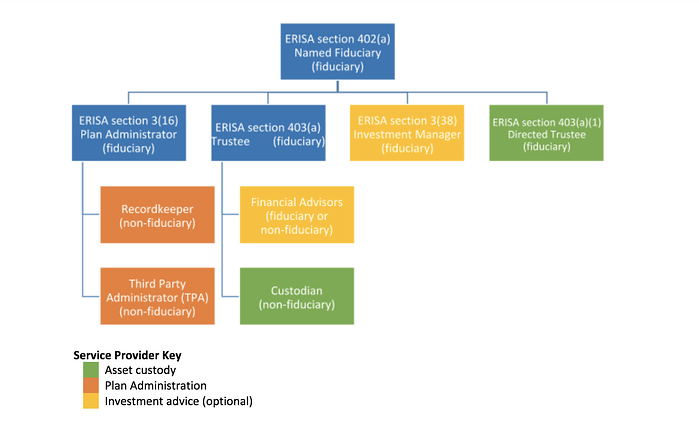 ERISA section 403(a) Trustee – is named in a 401k plan or trust document and has exclusive authority and discretion to manage and control plan assets. ERISA section 3(38) "Investment Manager" – is a type of financial advisor that assumes sole fiduciary liability for investment selection and monitoring. When an Investment Manager is hired, the Trustee is not responsible for plan assets controlled by the Investment Manager. An Investment Manager must be a bank, an insurance company, or an RIA subject to the Investment Advisers Act of 1940. ERISA section 403(a)(1) “Directed Trustee” – is a type of trustee that lacks the discretion of a full 403(a) Trustee. A Directed Trustee holds plan assets, but does not control them – they are subject to the direction of the Named Fiduciary in accordance with the terms of the plan document and ERISA. Recordkeeper – is responsible for tracking contributions, earnings and investments on a participant-level and directing the Directed Trustee or Custodian (as applicable) to execute trades requested by plan participants. Third-Party Administrator (TPA) – is responsible for annual ERISA compliance (testing, Form 5500, plan document maintenance, participant notice preparation). Financial Advisors – are financial professionals, other than a 3(38) Investment Manager, that render investment advice for a fee. Unfortunately, there is a confusing array of Financial Advisors in the 401k market – including brokers, insurance agents, investment advisers and financial planners. The key difference between them is their required standard of care. Investment advisers are subject to a fiduciary standard that requires them to act in the best interest of 401k plan participants. These advisors are generally paid a flat fee regardless of the advice given. Other advisors are subject to a lesser suitability standard, which does not forbid conflicts of interest (like the fiduciary standard). Compensation for these advisors can vary based on the advice given, which can result in conflicts of interest. Custodian – is similar to a Directed Trustee – they hold plan assets, but generally lack any discretionary authority with respect to those assets. Too few employers understand the basic 401k hierarchy that underpins all 401k plans and the responsibilities of each role within that hierarchy. This is too bad. Meeting 401k fiduciary responsibilities can be easy when an employer knows the party accountable for meeting each responsibility and monitors them accordingly.